This month has literally been a whirlwind . 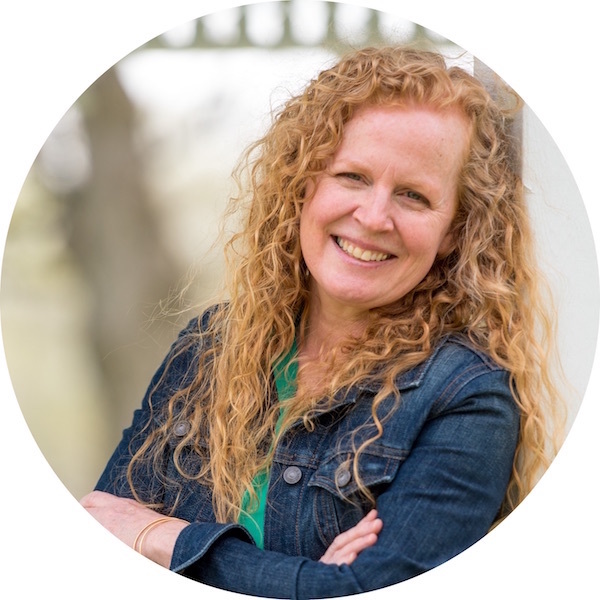 . . presenting in two different states, teaching full-time, holiday parties, kids concerts, a quick trip to Boston from Michigan to visit doctors at the Children’s Hospital (I may or may not be sitting in a hotel room in Bean Town as I write this . . .) and a myriad of holiday parties . . . it is a wonder I ever got these stations done before the New Year, but I did! And, hopefully, you’ll have plenty of time to relax, enjoy the holidays and do a little Morning Work planning before you head back to school in January to Ring in the New Year. So without further delay, here’s what’s in store for January. 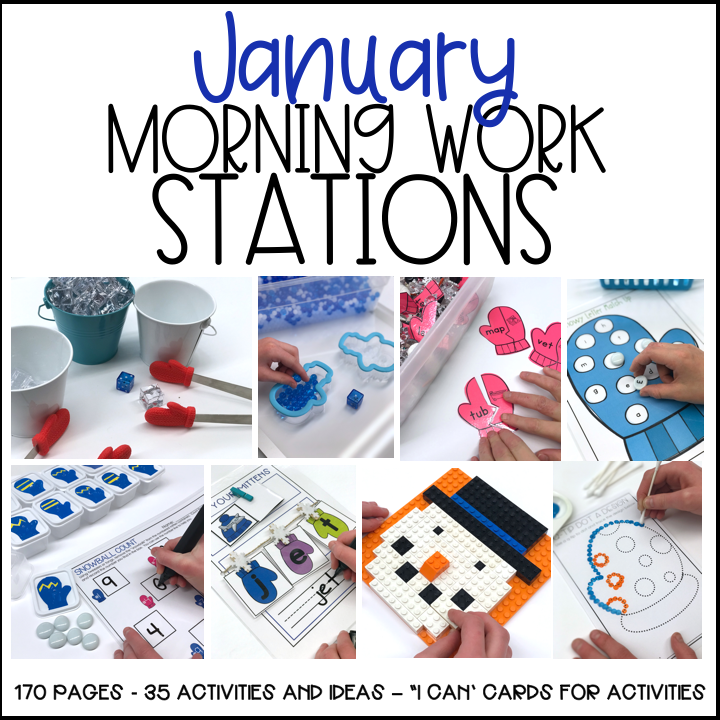 I have included a link that will take you to all the supplies you might need for each station within the directions for this set, or you can check out my Morning Work Materials Page HERE. 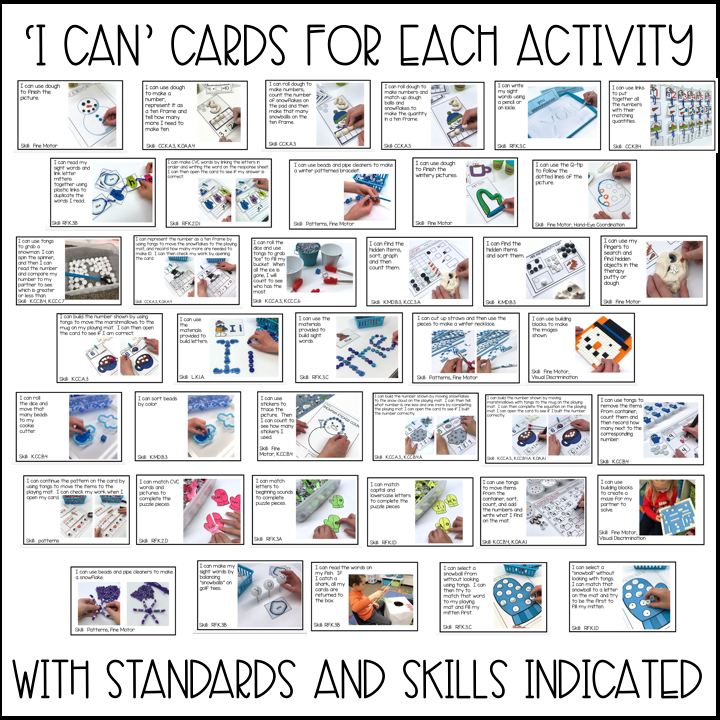 Within the packet, there is an individual “I Can” card for each activity. This, along with the idea of building off from activities from previous months’ activities, makes these stations incredibly independent if you need them to be. In all this month, there are 37 stations. I’ve included a very brief explanation of each below. 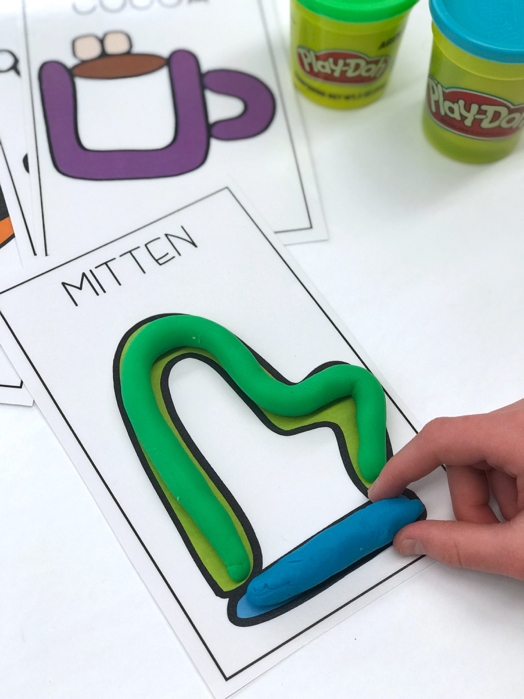 Student string letter mittens in order to make the CVC word pictured on the card. All they have to do is open the card after they have made the word and written below . . .
and they instantly get feed back as to whether they did it correctly or not. Grab those links from your cupboard and a hole punch. Student link their sight words (Yes, it’s editable so you can add your own words.) and spell the word by linking letters together. More linking . . . this time with numbers, quantities, ten frames and tally marks. 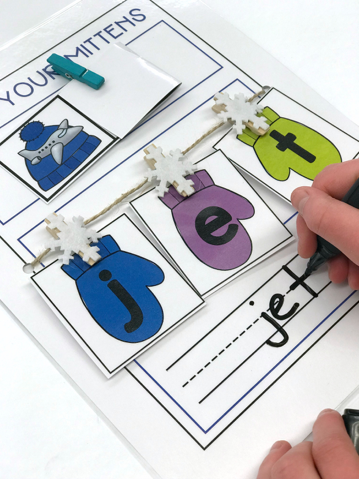 Insert the sight words appropriate for your students with these editable snowflake sight word cards. I make them black/white so you can easily organize and differentiate them by printing them on different colored cardstock. 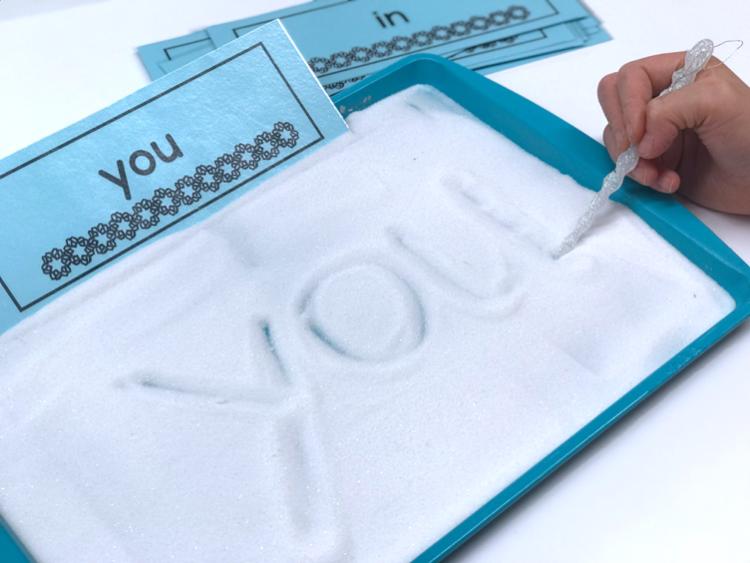 Grab one of your icicle ornaments from your stash of holiday decorations or a festive wintry pencil and students can write their sight words in ‘snowy’ sand. 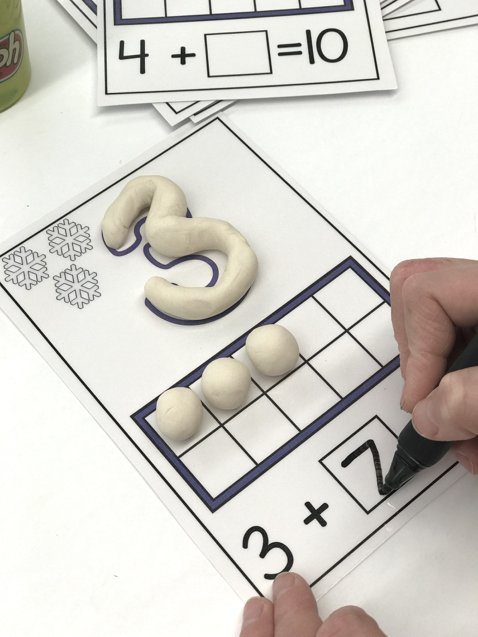 Making numbers and matching the quantities with dough is always a great fine motor activity. 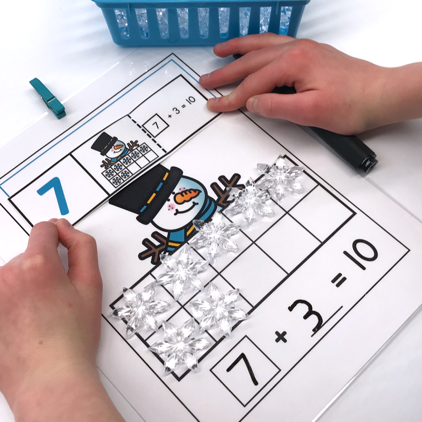 You can make this activity a bit more challenging when you turn it into a ‘how many more to make ten’ activity. Because I believe that my students deserve to get as much fine motor practice in as I can give them, I encourage dough play. . . A LOT. 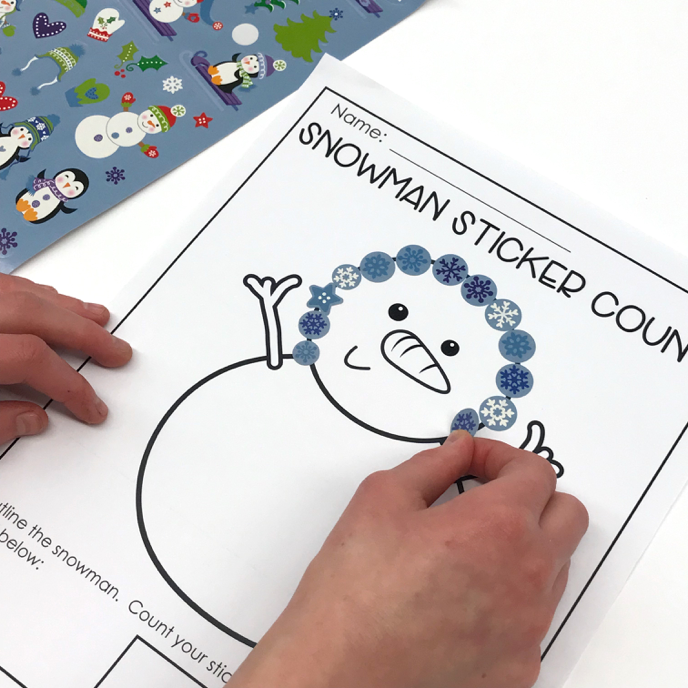 In this one students will complete thematic wintry pictures: create a snowman or decorate a mitten. 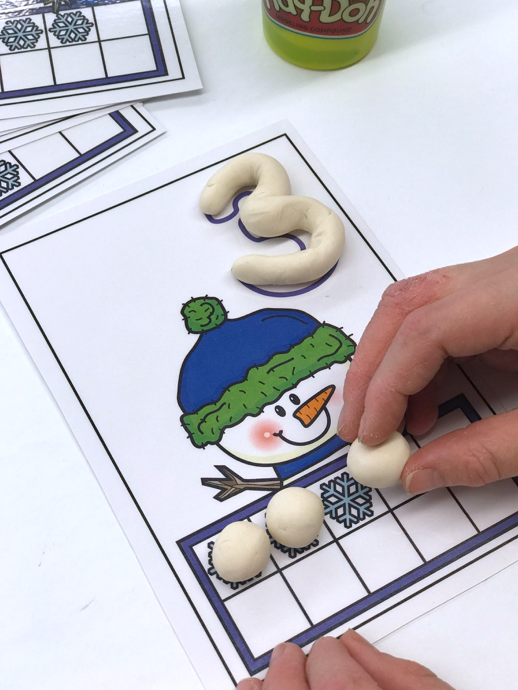 This dough activities encourages fine motor practice and supports winter vocabulary words. 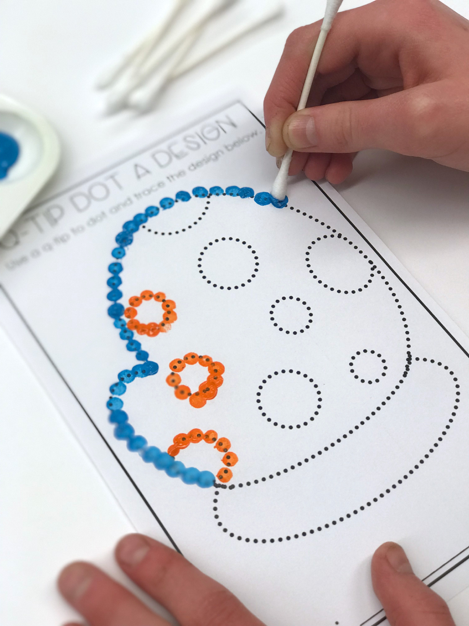 Always a class favorite, Q-Tip painting supports fine motor and hand-eye coordination. 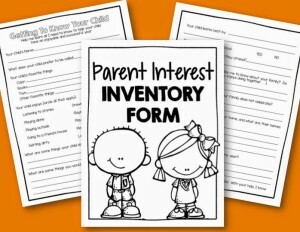 If you’d like to extend this activity, they can sort the items they find . . .
or even graph and count the items. 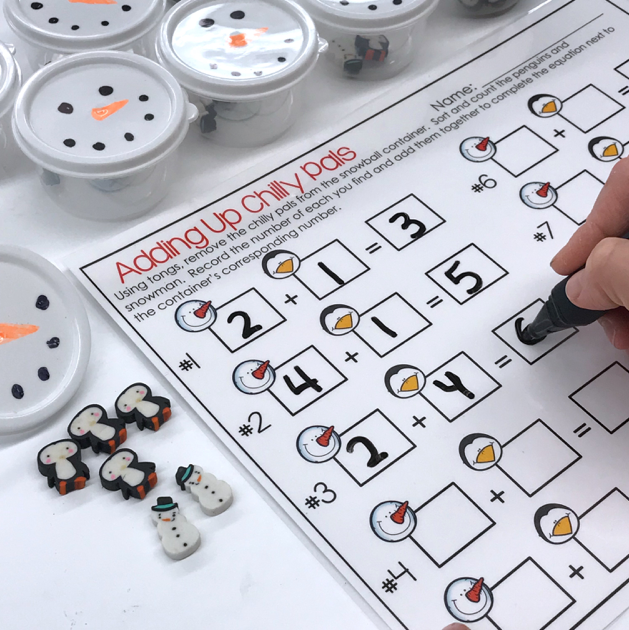 My students are all about dice in dice and these activities not only support fine motor but number recognition, quantities and addition (depending on the dice you use). I’m delighted at how quickly they know which number they have rolled without counting and how quickly they add the two numbers together. 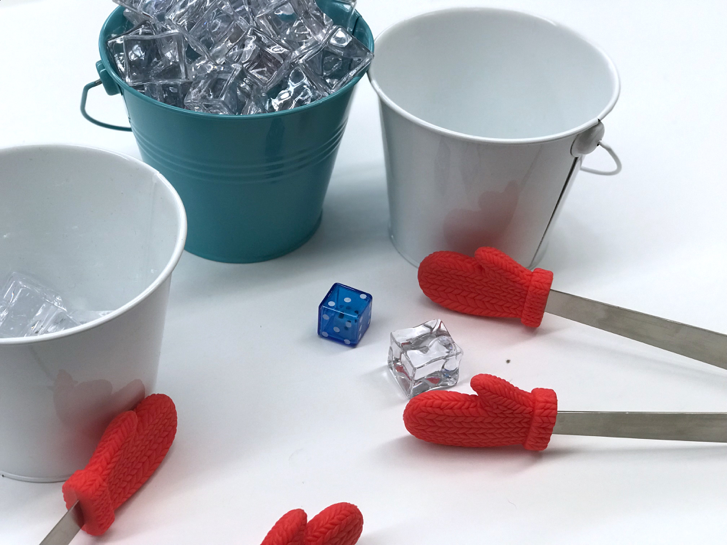 Using acrylic (fake) ice cubes, students roll the dice and move that many cubes until all the cubes are gone, and they can count to see who has collected the most. 14.Snowy Ten Frame Self-correcting Cards: How Many More To Make 10? 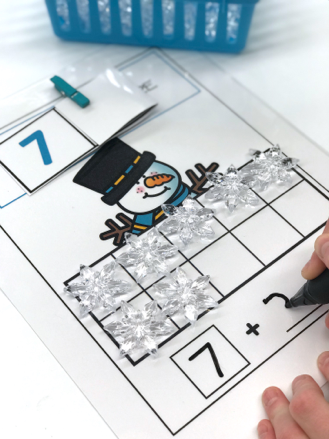 Another great self-correcting math activity, students use tongs to move snowflakes (pompoms, acrylic snowflakes, buttons or white flat marbles) to the ten frame to represent the number shown on the card and complete the equation. They then open the card to see if they made the number and completed the equation correctly. Did you know you can buy ping-pong balls in bulk? Even better because they’re cheaper, you can buy beer pongs. 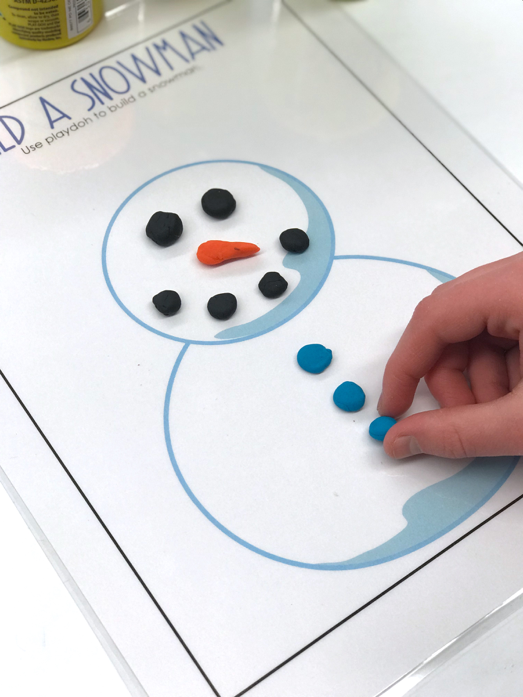 They make amazing sensory table filler and with some dots for eyes and a mouth and a centrally placed orange triangle, you can transform them easily into a little snowman. They make this number value game so engaging. 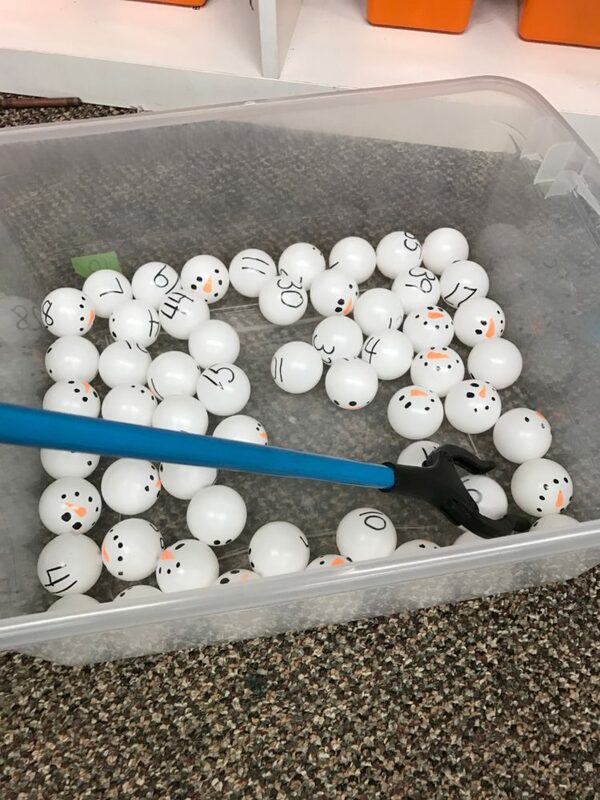 I have my students use Dollar Tree long-armed grabbers to pick up a snowman, identify the number and compare it to their partner’s. Then a spinner that says greater and less on it is spun to see which player will keep the snowman . . . the one with the greater or less number. More independent stations using self-correcting cards. 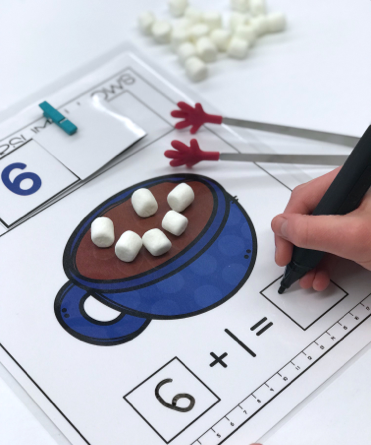 These are differentiated so if you have little ones that are still working on number recognition, they can use this set. 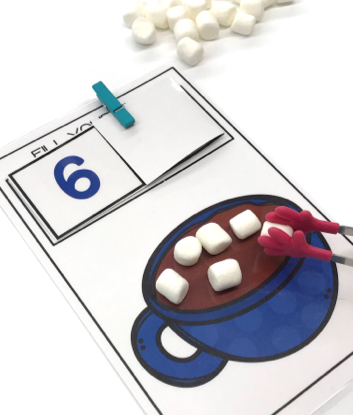 Grab some stale mini marshmallows and cute tongs to move the marshmallows to the playing mat. 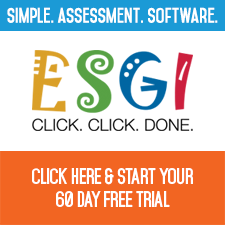 When you open the card, it will immediately tell your students whether they are correct or not. And for those students that need a bit more challenge, here students are still moving marshmallows, but this time they are adding one and completing the equation. When they open the card, they immediately know if they did it correctly or not. 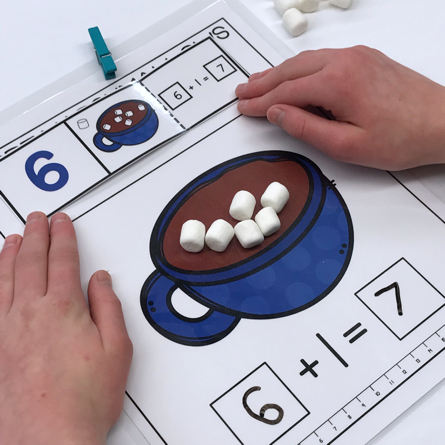 You’ll notice in this example, while the answer is correct, the child did not add the extra marshmallow. Oops. They don’t generally make that mistake more than once. Here’s another self-correcting set using cute little rhinestone snowflakes I found at the Dollar Tree. You could also use flat white marbles or pompoms or buttons. And then they open the card to confirm whether they are correct or not. 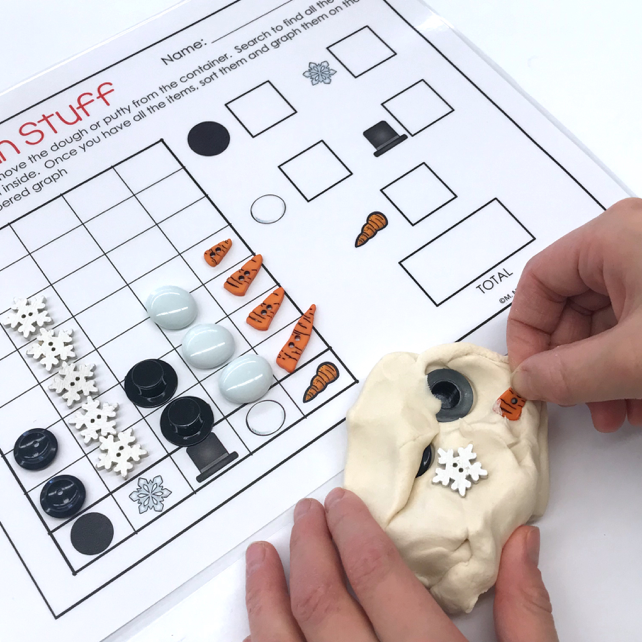 Probably one of my students’ most favorite stations, sticker counting sheets are amazing for fine motor and it will get your students counting. I have a couple of options for students to select from in this set. 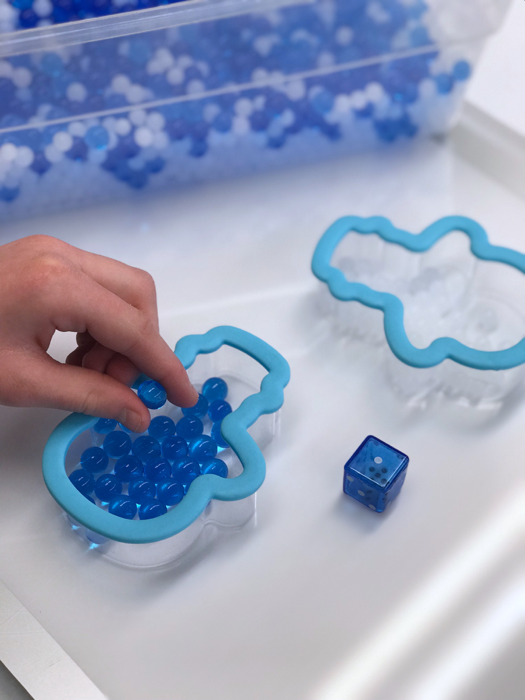 This month’s gel beads are blue and white. I used the extra white beads from Christmas (There are a ton that come in those little bottles.) and some blue ones. 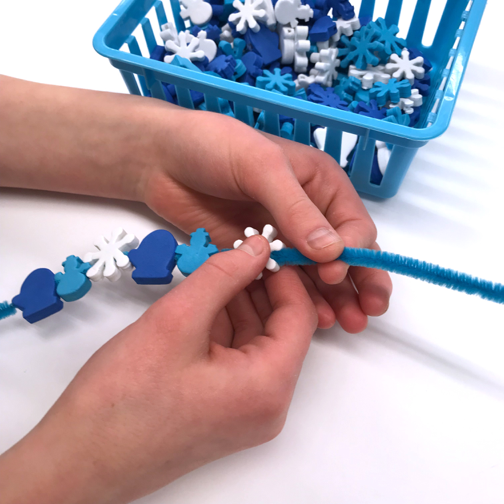 Pick up some snowman or snowflake cookie cutters and your students can sort the beads by color. I have a rule that they can only pick one up at a time, assuring they use those pincer muscles. By the way, if you want to take gel beads to the next level, stick them on top of a light table. They are SO beautiful. Need a bigger challenge? Throw in a dice of your choice to see who can fill the bottom of their cookie cutter first. 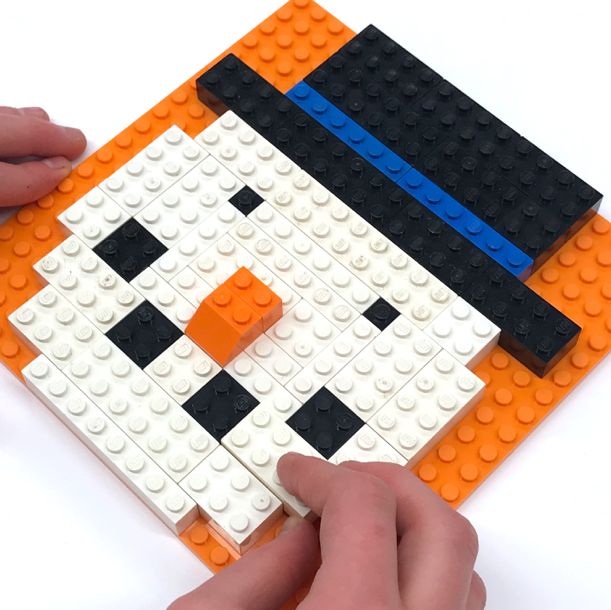 There are three building Lego challenges this month as well. 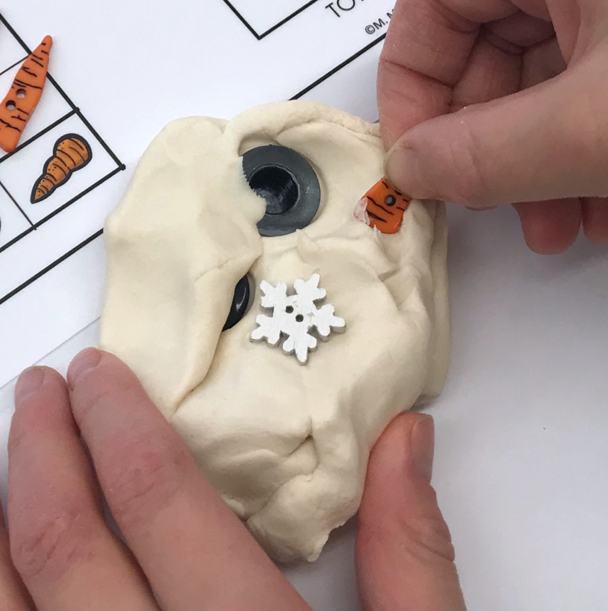 My students will choose to try to build a design of their own or replicate a snowman, mitten or snowflake. 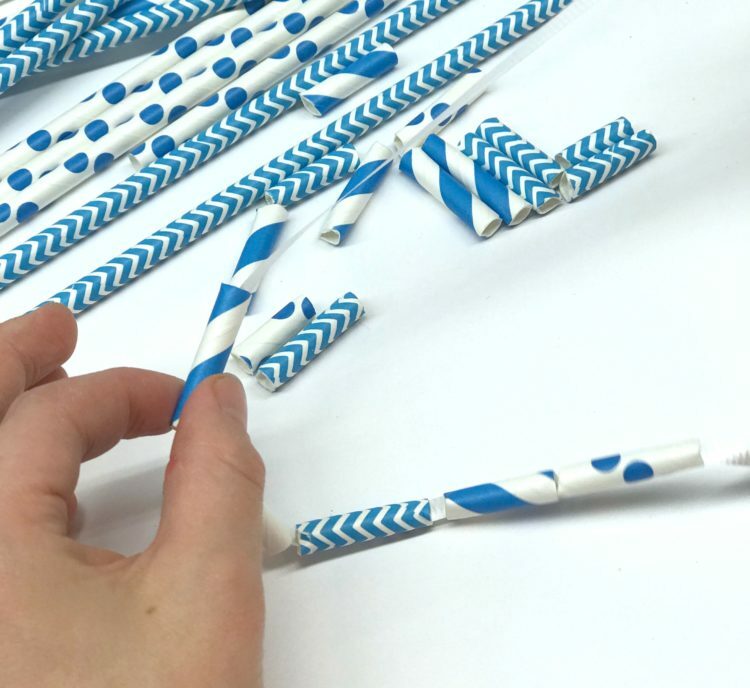 Straws act as a great resistance when cutting and building fine motor muscles. I like these paper ones that come in different patterns. But what do you do with all those little straw pieces? Read on. You can get foam beads in bulk from Oriental Trading or Amazon. I have literally had these builds for YEARS and still have a bunch left over. However, you can use regular pony beads or even buttons if you’d like. I encourage my students to create a pattern of their choosing and then I turn it into a bracelet for them. 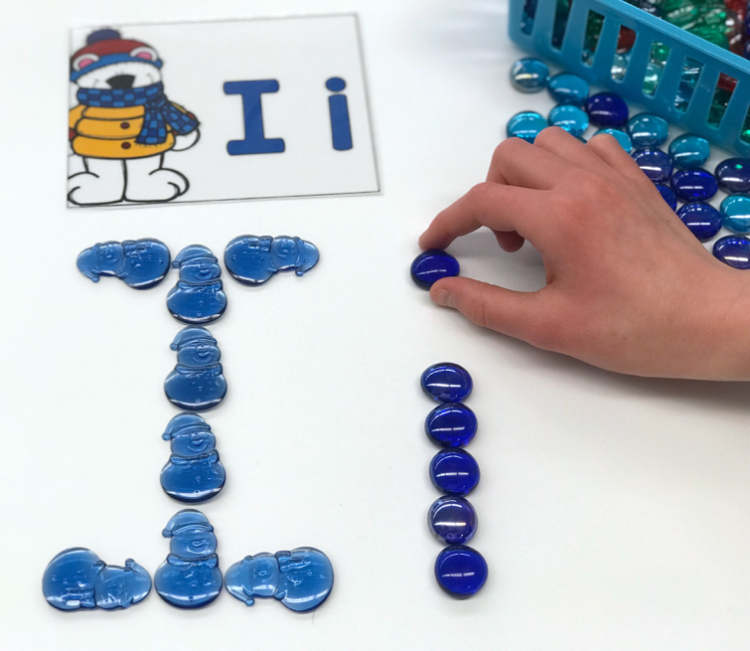 Giving your students multiple ways to practice making letters and words allows you to respond to all those different kinds of Multiple Intelligences. 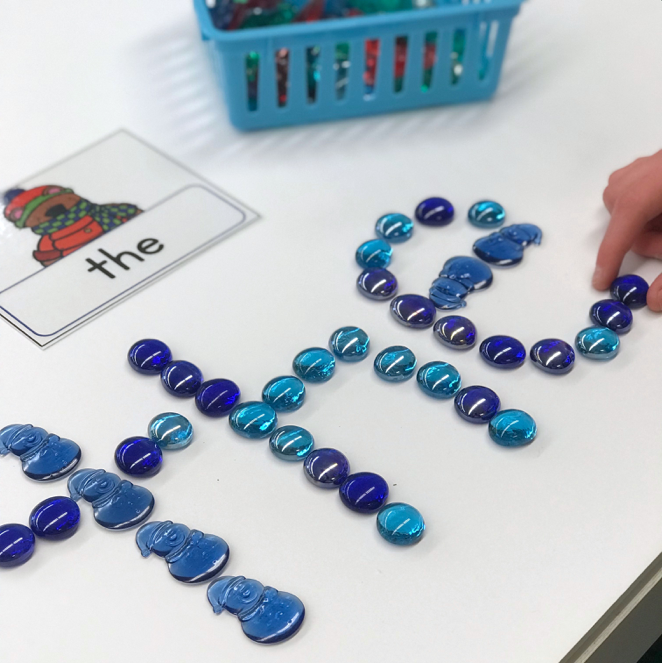 By using gel beads, even those students who are still struggling with recreating letters using pencil and paper can reproduce them using building materials. 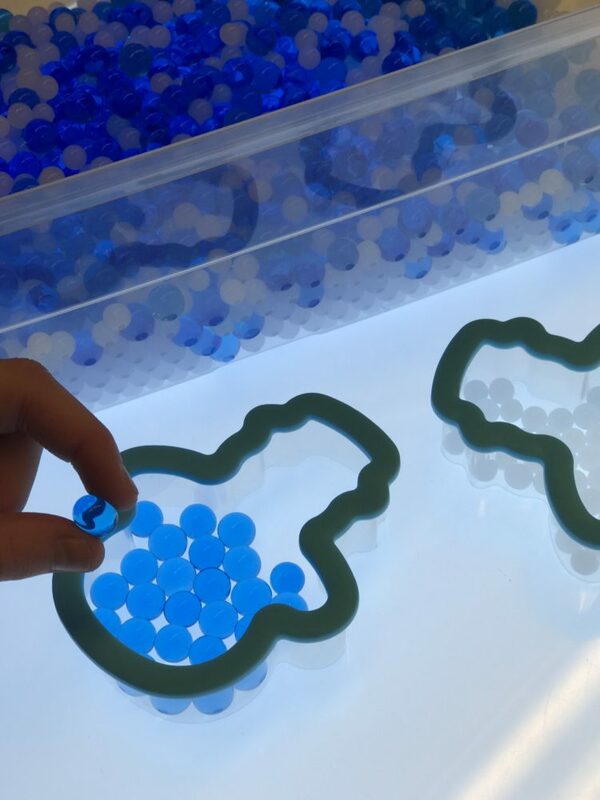 In this case, translucent flat marbles and snowman table scatter. If you still have that light table out from using get beads, throw these materials on it. The light shining through is a great sensory activity. 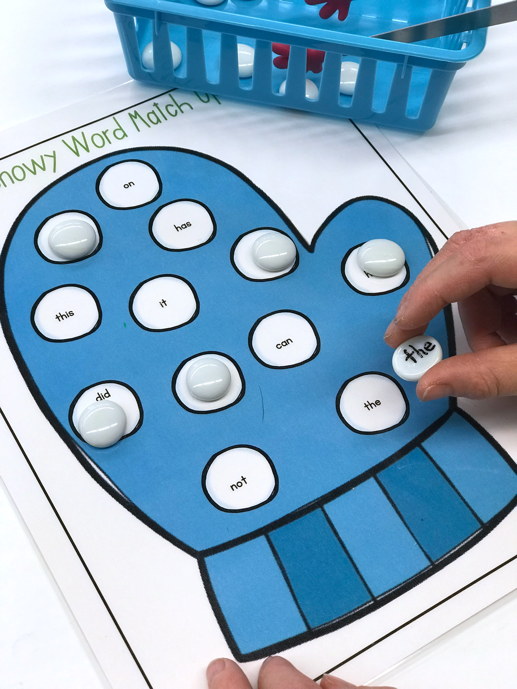 I added editable sight word cards for you to print off the words that your students need to practice, because, let’s face it, your words are most likely not the same as the words my kids need or the teacher in the next school. This way, everyone gets the sight words they need. For a whopping $1.00 you can 10 of these little mini containers at the Dollar Tree (or use any small container you can find really). I painted a small mitten on each one to differentiate this set from the next, and then I placed ‘snowballs’ of different quantities in each one. These are for my kinders still working on counting one-to-one. 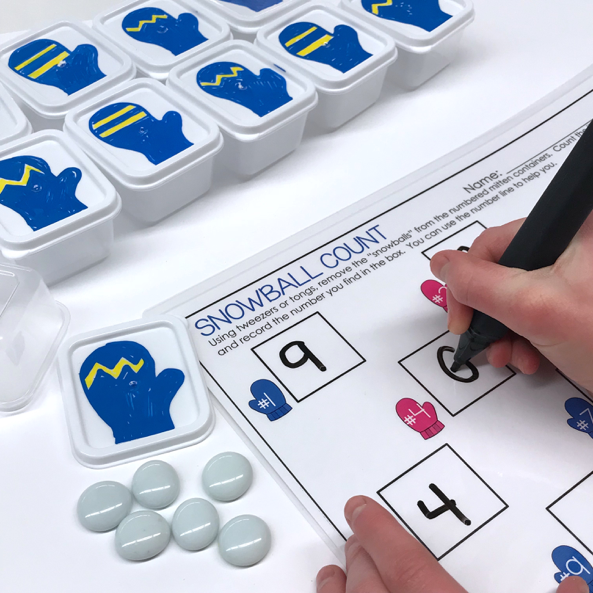 They empty the contents and record the number of snowballs next to the corresponding numbered mitten. For students who need a greater challenge, I have a second set of containers that I turned into snowmen. Inside, I have penguin and snowman erasers of different quantities. Students will sort and count each type of eraser, add and record the answer. Or if you don’t have the snowmen and penguins, never fear. 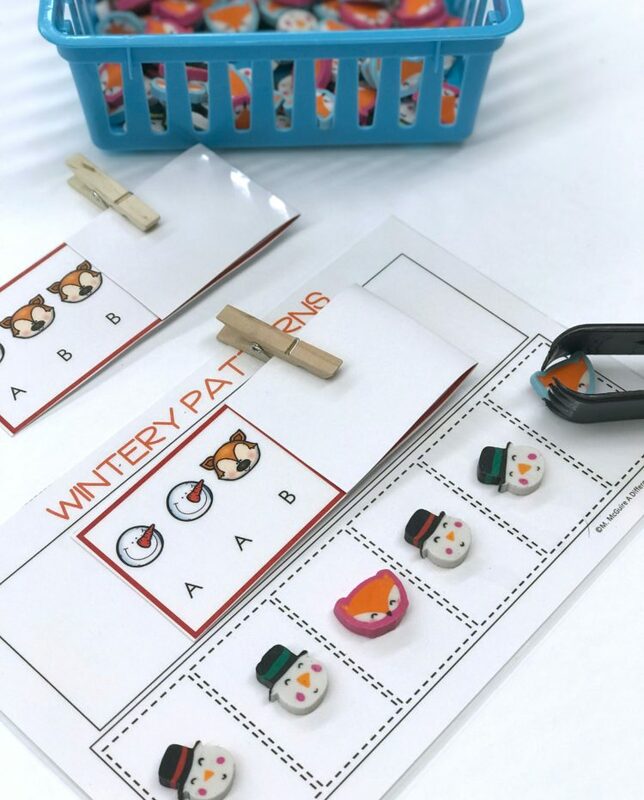 I created an extra recording sheet for foxes and snowmen like the little erasers from the Target Dollar Spot. 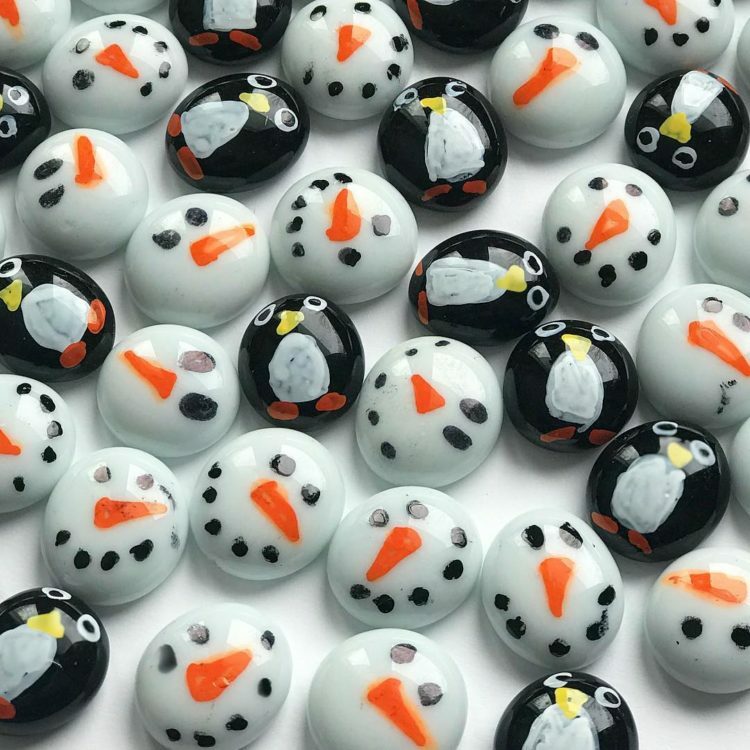 Or if you want to make something really cute, how about these little flat marbles I turned into snowmen and penguins with the help of some paint pens. Easy Peasy! These sets are all black and white so you can print them on different colored Astrobrights paper to easily differentiate them. 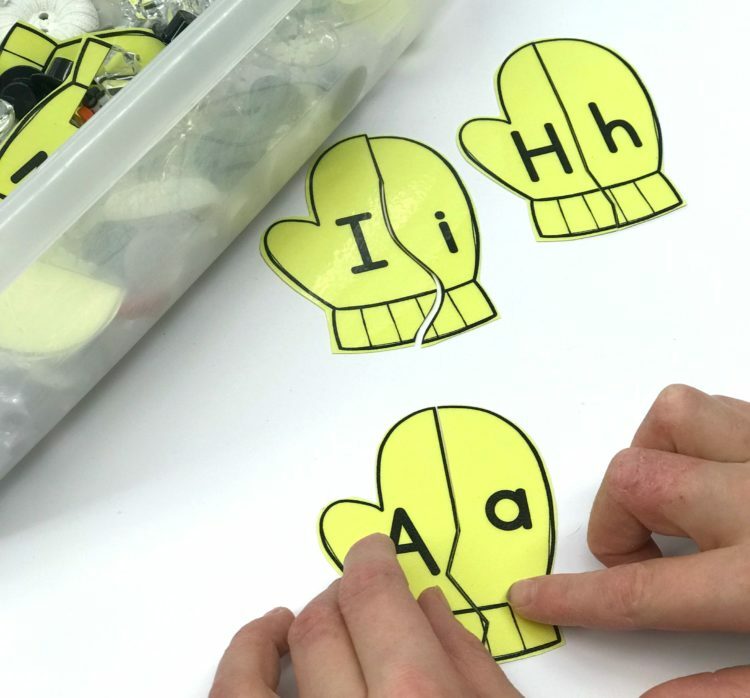 One set of mittens have students matching capitals to lowercase letters. 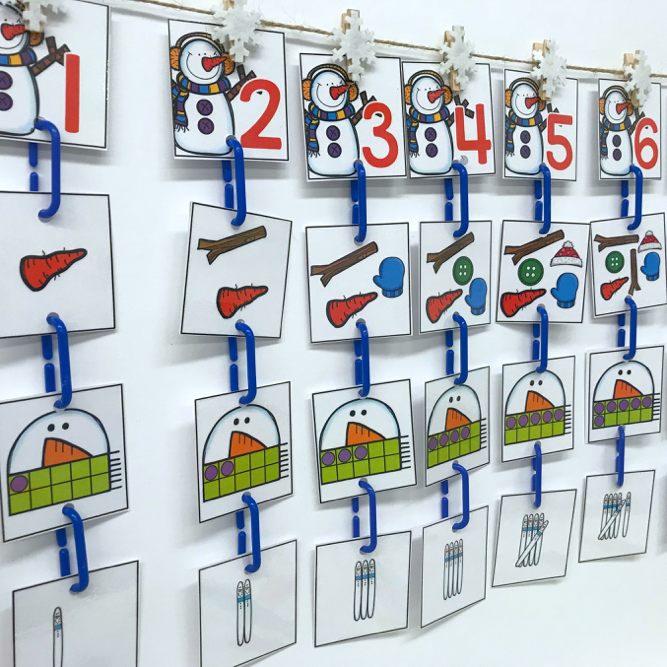 Another set has students matching letters to beginning letter sounds. And this set has students matching simple CVC words to pictures. 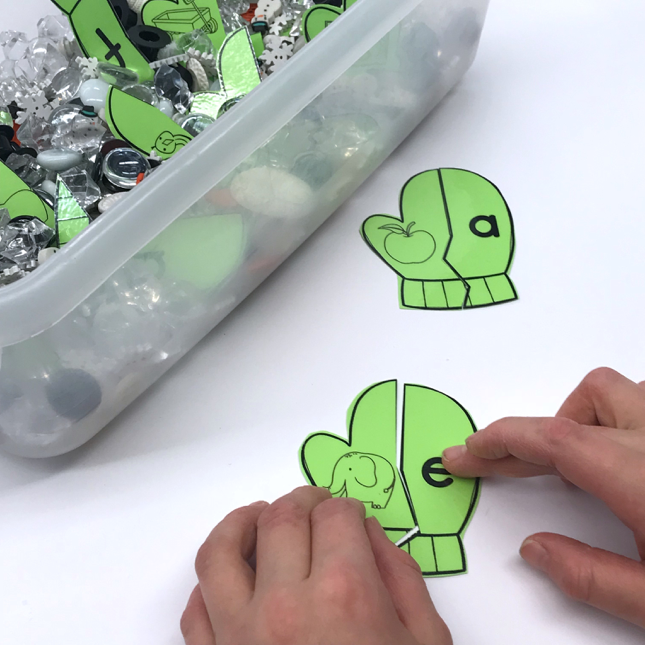 Use Target Store erasers you’ve been hoarding for this fun, self-correcting patterning activity. 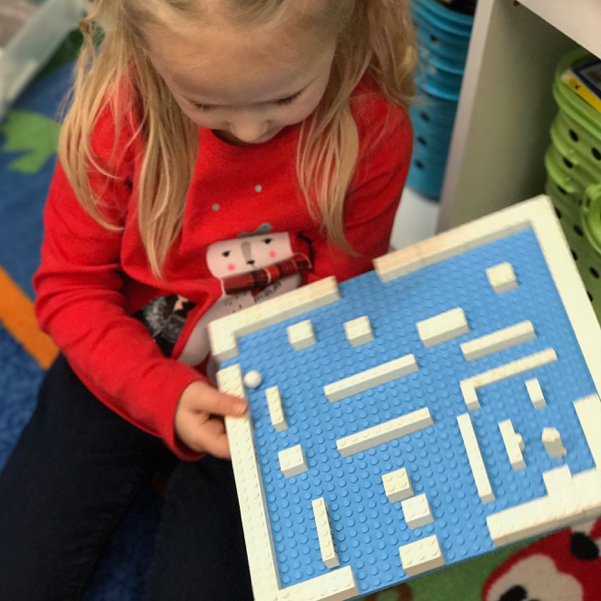 Students create the pattern . . .
and when they open the card, they immediately know if they have reproduced it and continued it correctly. Don’t fret if you haven’t secured these cute erasers. 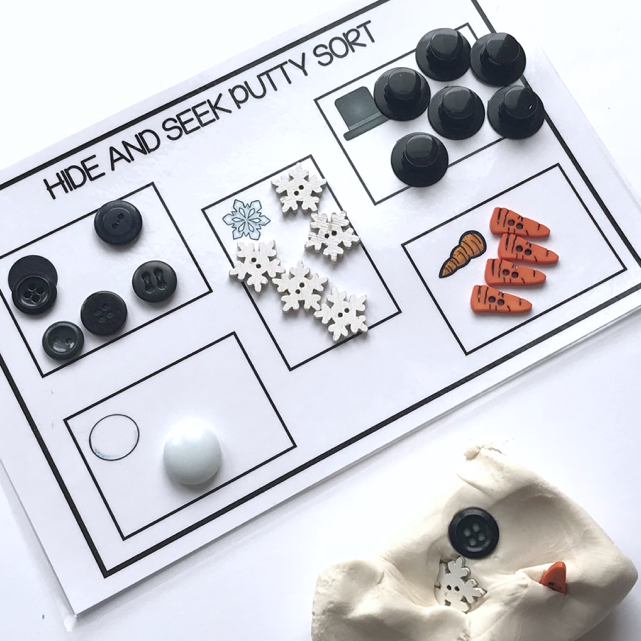 I promise, you can use flat marbles in white, black and orange, or buttons and the activity is still fun. 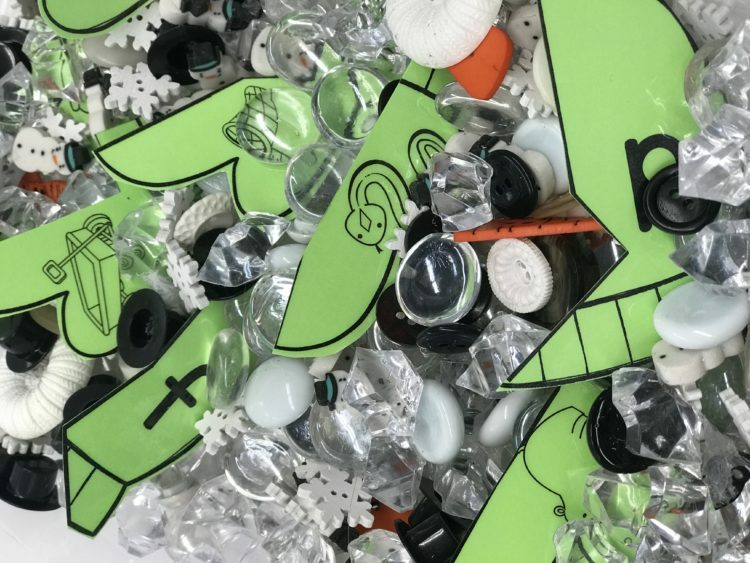 You purchased a ton of those white flat marbles, right? I hope so because here is where you turn them into letter snowballs. Students take turns choosing a snowball to match to the playing mat. The goal is to be the first to fill your mitten. 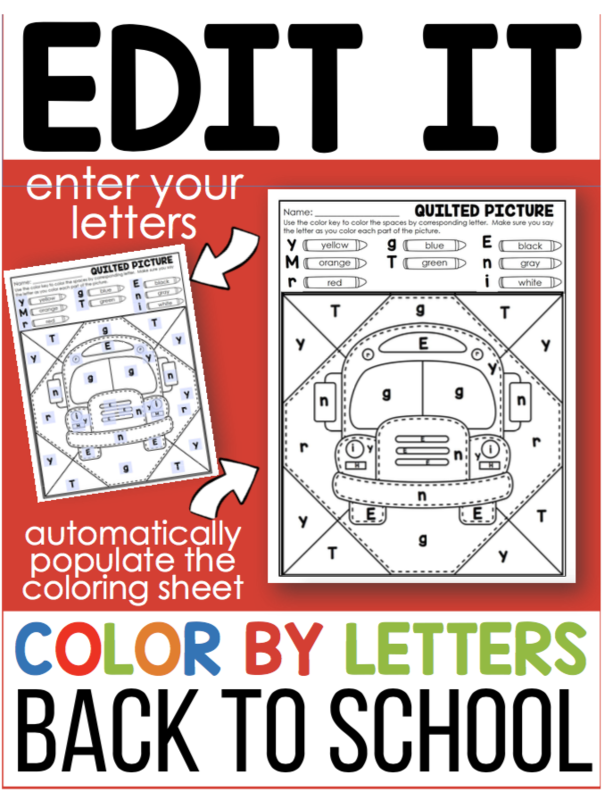 Of course, I have made this mat editable so you can enter the letters that work best for you. 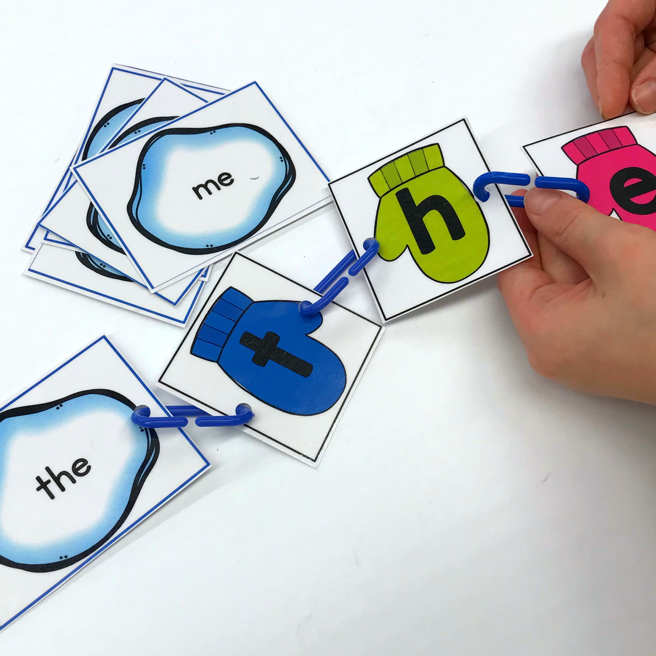 Same idea but this one is for your students who need sight word practice, and yes, it is editable. This activity is one I have had for many years but I added it because I still have readers that don’t know about them. 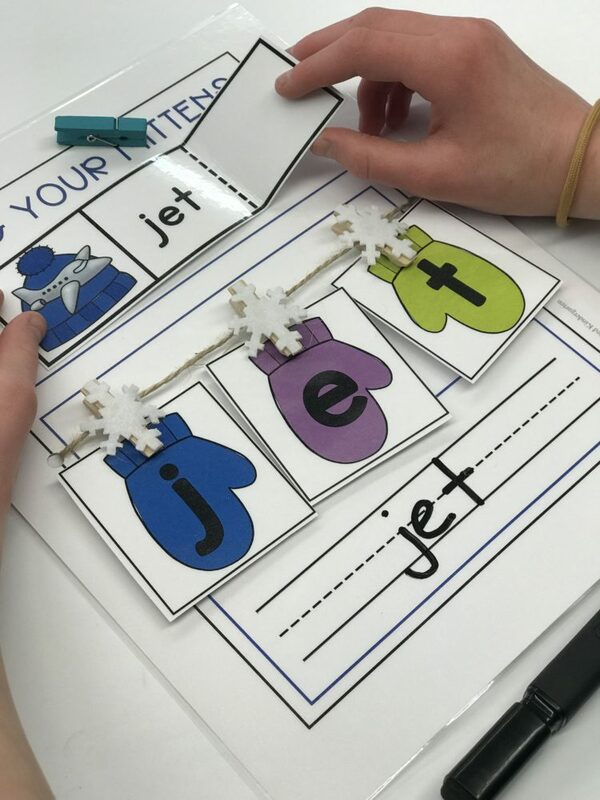 These editable sight word fish make ice fishing for sight words easy to differentiate when you print them off on colored Astorbrights Cardstock. 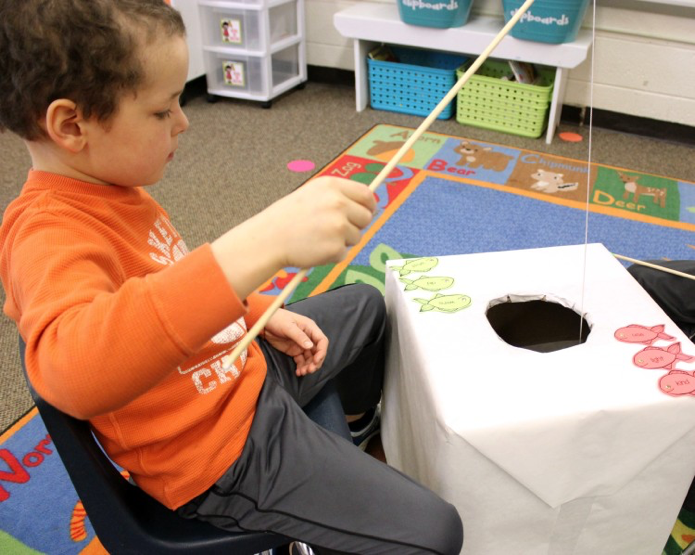 Your students will want to play long after all the snow has melted. You’ll be utilizing more ping-pongs for this activity. I like to use a Sharpie to write letters on them, and I house them in a clear egg carton for easy storage. 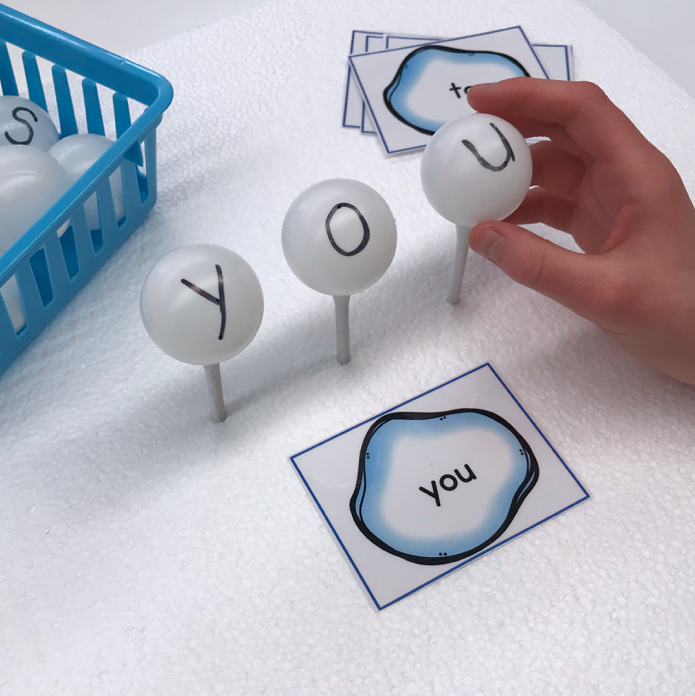 The snowball sight word cards are editable, so this allows your students to have another activity (other than paper and pencil) where they can practice those hard to master sight words. Just stick a couple (3-6 depending on the number of letters in the sight words you have to master) of golf tees into a flat piece of Styrofoam, and you’re all set to go. 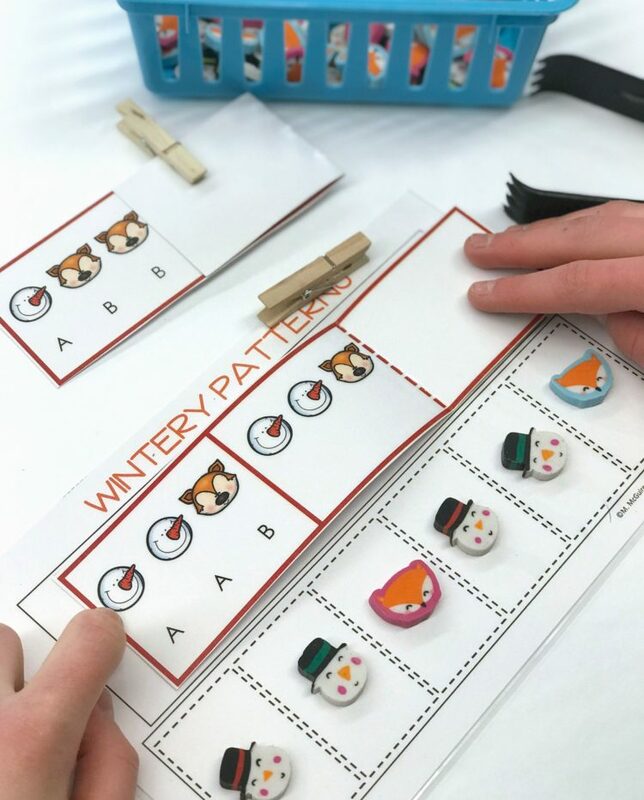 Because I like to provide lots of patterning activities, I believe our students do not get enough ‘creative’ activities in their day, I try to offer something a little crafty or artsy. 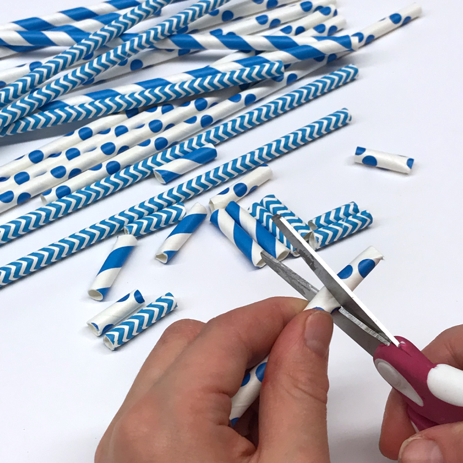 Simply cut three pipe cleaners of your choice in half and twist them together. 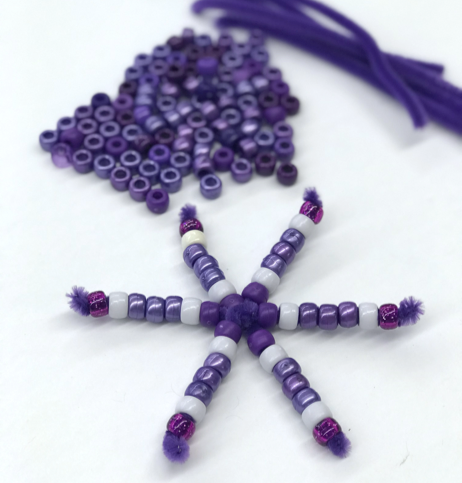 Then students can string pony beads on each end to make a snowflake. It’s super easy and they turn out so pretty. And there they are. Everything you could possibly need for a month of engaging and fun Morning Work Stations. I could never use all 37 in my own setup, but I like to provide lots of choices for all of you based on what you may or may not want to have your students practice or what materials you may or may not have at your disposal. I hope you see something that you like. If you’d like to learn more, please click on the picture below to check out these stations as they are listed in my TpT Store. And as always, feel free to drop me a line with any questions. Morning Work for December is HERE!